When Meeta suggested a Blog Swap I thought it was an great idea, we have such similar tastes in food and I love Meeta's food photography, she's really talented. Since we're both huge Jamie Oliver fan's we decided that a tribute to Jamie would be the perfect theme for our swop. We decided to pick recipes from Jamie's Italy (any readers of my blog will know that this is currently my favourite cookbook). Here is what I finally picked, I hope you enjoy it! 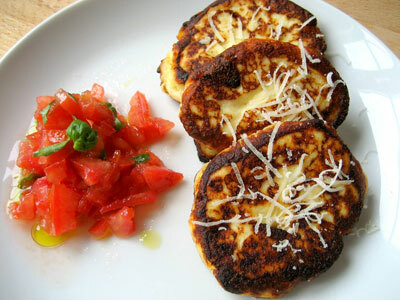 Mix the ricotta with the flour, cheese, seasonings, egg and place in the fridge. I now understand what Jamie was going on about when he said to try and get your ricotta from a deli, I use supermarket ricotta, it was quite wet and so needed much more flour to get a workable consistency. I found this out after the first couple of "pancakes" fell apart whilst being fried. Mix the chopped tomatoes, chilli, basil and season with salt and pepper. Add some extra virgin olive oil and a splash of red wine vinegar. Heat a nonstick frying pan containing some olive oil and fry spoonfuls of the ricotta mixture over a medium heat until golden brown on each side. I thought these were really tasty, I think they would make perfect starters but don't think I would make them as hot canapés. If I'm making hot canapés I prefer them to be something which can be put in the oven but that is only personal preference. Just like each of the little pancakes, lol! That looks completely beautiful, and so tasty! 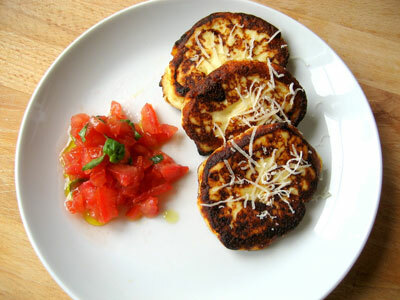 I'm going to have to try to get my husband to make these - he's really into making his own ricotta lately, and this should give him inspiration to make a new batch. I'll post the link here if he does it! I am going to try this dish and hope get good results.